We Brits tend to shy away from overly glamorous going-out outfits—you're more likely to see a row of Converses on a Saturday night on the Tube than stilettos. Many of us prefer to wear our everyday jeans on a Saturday night, but that doesn't mean you can't dress them up in a new way. 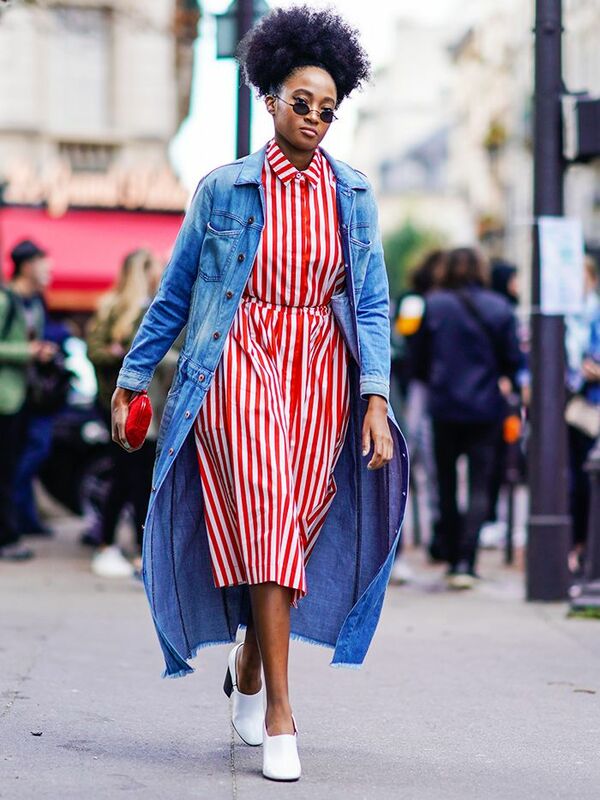 If you are looking for an outfit idea to try out for your next birthday party or night with the girls, then we've found six going-out outfits revolving around denim to bookmark now. If you want to look chic and expensive, then look no further than Jeanne Damas, and if you want to have fun with sequins, then you have to see how Tiffany Hsu dresses down a party dress with ripped denim. Scroll through the gallery below to see seven of our favourite going-out outfits that revolve around jeans. Style Notes: Lucy Williams often wears jeans and a white T-shirt, but she takes this from day to night by swapping her tee for a slinky camisole. Style Notes: Lizzy Hadfield dresses up her Weekday jeans and black tee with these amazing Topshop heeled sandals. Style Notes: Soraya Bahktiar dresses up her cut-off jeans with a golden embellished kimono robe from Zara. Style Notes: Jeanne Damas proves that sometimes nothing looks as elegant as a pair of dark-wash skinny jeans with an expensive-looking white blouse, black patent heels and a red lipstick. There's a good reason this is a long-standing Parisian after-hours uniform. Style Notes: Dress up your everyday jeans like Kate Foley by layering a super-feminine dress over the top and adding shoes with a touch of sparkle. Style Notes: Who What Wear's Kat Collings dresses up her classic Levi's with a pair of red Balenciaga knife heels and a J.W.Anderson statement top, which is super fitted at the waist. Style Notes: Fashion buyer and style star Tiffany Hsu shows that ripped denim can be an excellent way to dress down items you might usually save for New Year's Eve. She made her sequin off-the-shoulder Magda Butrym dress and mirrored silver stilettos look so much cooler by pairing them with a pair of boyfriend jeans with ripped knees and turn-ups.